As dads continue to strive for equality in parenting, modern day media persists in poking fun at the so-called incompetency of bumbling fathers. We’re not talking about 1983’s “Mr. Mom,” but far more recent works. You may recall that in 2012, Huggies started a marketing campaign titled, “Have Dad Put Huggies To The Test.” The series of ads portrayed dads as inattentive caregivers, and thus, propagated old-fashioned stereotypes. Huggies received a heavy dose of backlash from dads, who shared their disappointment over the ads. The marketers at its parent company, Kimberly-Clark, were forced to embark on some serious damage control after one father started a “We’re dads, Huggies. Not dummies” petition that garnered more than 1,000 signatures in less than a week. Social media fervor grew – Huggies learned a quick lesson the hard way and swiftly pulled the ads. Despite all the profuse and warranted apologizing that followed, Huggies didn’t seem to learn from its unfortunate experience. To this day, its website still contains maintains a “Mommy Answers” page with no comparable dad counterpart. Huggies print ads also continue to speak only to mom by name, and there’s gender biased language on its site throughout. Yet, one of its worst jabs is even more recent – which harkens to its “dad test” campaign – and you can find it live at huggies.com. It’s almost unthinkable to believe a headline like this could exist anywhere, but it does. Imagine seeing a story titled, “4 Ways to Get Dads to Cook,” if you’re looking for a comparable headline that would too cause an uproar. Like so many other “parent/baby” companies, Huggies will claim to speak to both moms and dads. Huggies has even taken steps to sponsor the At-Home Dads Convention, donate diapers to the National Fatherhood Conference, and has an ongoing relationship with the City Dads Group – all noble and noteworthy causes. Between Huggies’ generous donations and disparaging story – it creates a strong disconnect we can’t ignore. Huggies’ lack to change its marketing strategy towards dads and genuinely embrace them as valuable shoppers is an example of how respect for dads seems to continue to take a massive backseat to the unwarranted stigma about dads. Gender equality can never be achieved without dropping the sly innuendo that degrades and belittles the institution of fatherhood. Right about now, dads could use a hug. What do you say, Huggies? A quiz: what kind of magazine will it be? 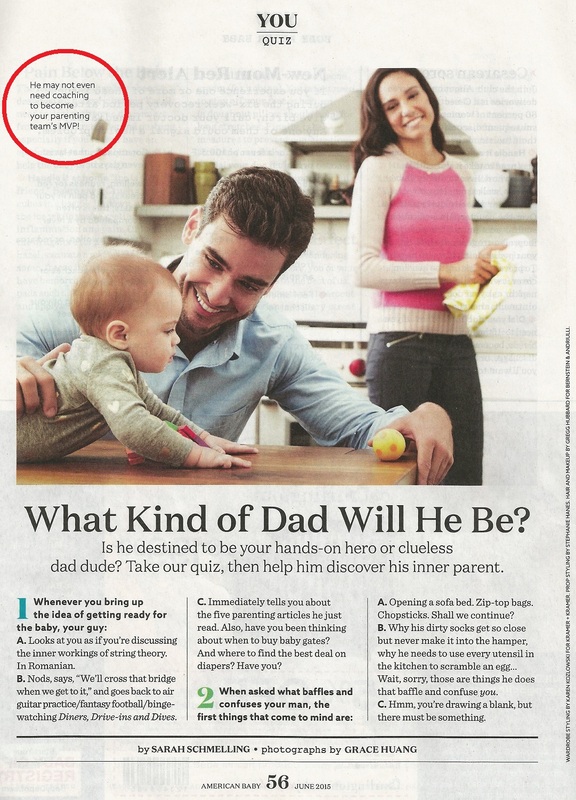 Just when we think American Baby magazine is leaning toward doing something right by placing a dad on the cover of its June 2015 issue (no doubt a gratuitous Father’s Day nod), we turn inside to find an article trying to be humorous, and rather offends. First of all, we know ABM is geared toward mothers, despite its name. The advertising and writing all fuel the bias that moms are the lead parent, and that dads don’t count. For a magazine to continue with a title name that truly suggests nothing otherwise (yes, both women and men have the ability to care for babies), this is wrong – but you have to remember this magazine’s mission as you proceed with this piece. After all, a quick flip through ABM’s pages indicate the heavily unbalanced photographic tally of 44 images of moms, compared to just 11 dads. It’s like this every month. If language expresses intent, then what does that lopsided ratio suggest? We can even look past Sarah Schmelling’s humorous tone, which somehow finds a way to dig at men by using every possible sexist connotation imaginable. By comparison, do women really find it funny when men try to be comical and use the, “a woman’s place is in the kitchen” line? Check out the photo caption at the top of page 56 (pictured above). “He may not even need coaching to become your parenting team’s MVP!” Talk about incongruous writing – first AMB is acknowledging that dads are on the parenting team (and the possible MVP, no less!) – yet the rub is in the first six words: “He may not even need coaching”? That’s some seriously curious language, because mothers bear no more instinctive abilities to parent a child than fathers. One can argue whether being a parent is an instinct or an acquired skill, but one parent doesn’t possess the skill more than the other simply by way of gender. Although this website talks about a slightly different but related topic, here’s what one wise, hipster homemaker has to say about dads and babysitting. In the last section of the article under “MOSTLY C’S,” the author uses the phrase “Mr. Mom.” Don’t get us started on the use of that term (because we already have), but in short, would anyone dare call a working mother “Mrs. Dad”? 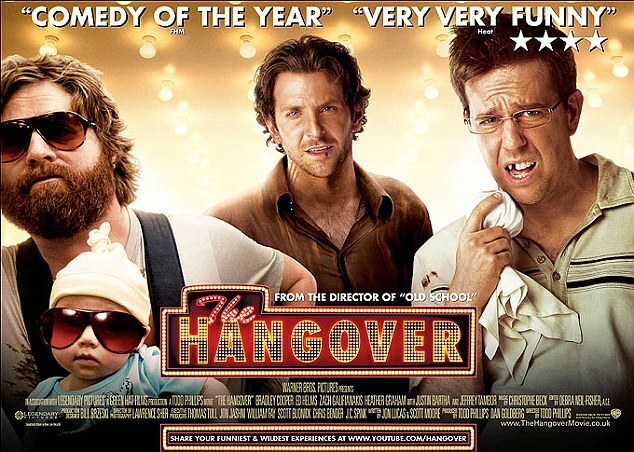 It’s hard to give the author kudos for the wonderful, cute ending, “Few things are more fun for a child…” when the previous sentence exhausts the last of several tired, unflattering stereotypes, suggesting that every dad must live “The Hangover” lifestyle every weekend. 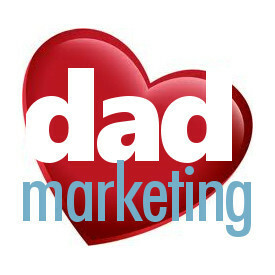 C’mon dadmarketing, you might say, have a sense of humor. With stereotypes, there’s always someone who isn’t laughing. Hopefully by the next time ABM releases next year’s Father’s Day issue, we’ll have a magazine that helps celebrate, appreciate and thank dads for all they do, rather than create an unnecessary divide on the parenting team. This headline appeared in the Gainesville (Ga.) Times last month, and I suspect it went largely unnoticed across the nation. With this newspaper article is a headline which places a sexist stereotype on mom, and one that must surely offend both mom and dad in the process. Is a mom’s place is in the kitchen? 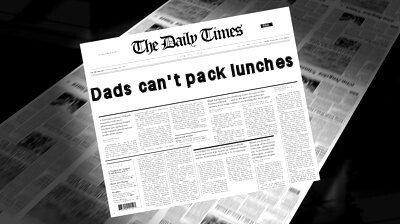 Is it such that dads can’t cook, or manage to pack a lunch? Everyone knows that the headline is the text indicating the nature of the article. The newspaper could have been more responsible with its duty and used a clearer, less offensive term, or rewritten it entirely. Who packs the lunch has nothing to do with the story’s main topic (which, by the way, is a good one), that schools are serving healthier meals than ones students bring from home. Instead, we get a headline rich in stereotype. The second sentence really answers the question as to why it was chosen, but why use the mom reference? The third sentence explains that, which is an assumption based on old-fashioned labels society has created over time; it may or may not be true. All of this reminds me of the oft-used “Mr. Mom” title. Others seem to think it’s fine to typecast a stay-at-home dad as “Mr. Mom.” But no one would dare call a breadwinning, working mom by the title “Mr. Dad.” So why is it still fine to say that only moms make lunches? It’s not. Finally, let’s not let the Associated Press off the hook. Its “suggestion” is one that categorizes, labels and stereotypes. It’s wrong. The media plays such a powerful role in shaping our minds and attitudes, and it should know better. And I always thought it was the media’s job to report the news, not create it.